1. Web users have a tendency not to read important things like instructions and privacy policies. They like to click on shiny buttons without understanding what they’re getting into. 2. Product descriptions are typically designed to sell product – not to be open and honest about its strengths and weaknesses. 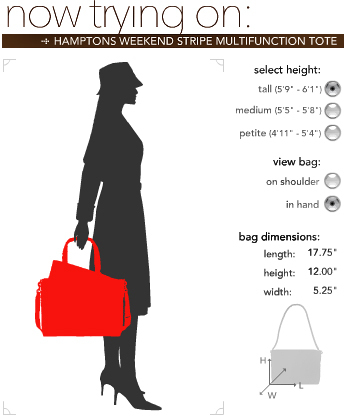 If your product descriptions are big, long blocks of text, they’re less likely to be read. Try breaking up copy into smaller chunks, use headings and sub-headings, bullet points, images and tabular data. Much more user friendly. Consider incorporating the positives and negatives into your product descriptions. Customers love to read reviews by “people like them” because they believe they will be more open and honest about their experiences. This generation is far less trusting of marketing hype. Be refreshing and write like a customer. Read reviews, not just on your own site, but on competitor sites. Use what you glean from many, many customer reviews to improve your own product descriptions. Most products benefit from multiple images to show front, back, inside, accessories, etc. If you sell software, show screen shots. Give the customer as much visibility into your product as possible. 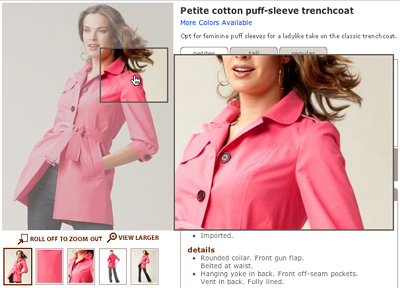 At minimum, allow customers to zoom to a high resolution image, and for bonus points, use 360 degree shots. Another common reason for returns is a color looked one way on the computer screen, and totally different out of the box. Furniture.com had a clever idea – show a picture of M&Ms. If the colors in the candy don’t match those in the real life treats, the user should adjust his or her monitor. products on models show size and context. Some product types like software and electronics are returned, not because they are defective, but because the customer can’t figure out how to use them. I recently bought a used camera off eBay which did not come with an instruction manual. Knowing nothing about DSLRs, naturally I couldn’t figure out how to adjust my settings. I just assumed I must have bought a lemon. I did find a camera expert who showed me how to use my camera, but many customers will simply send the product back). A ShowUHow study found online video instruction guides reduced returns up to 30%, sales by as much as 20%, and reduced customer support calls by as much as 50%. Customer feedback revealed that 84% of those who watched instructional videos preferred them to calling 1-800 numbers, and 95% to using printed user guides. 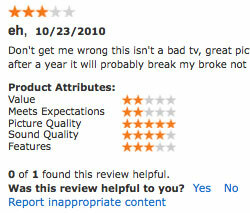 Simply having customer reviews is a good start, but the presence of review content alone is not optimal. Consider the helpful features in today’s product review tools. Amazon allows customers to provide feedback on reviews, marking them as “helpful” or “not helpful,” and features the “most helpful positive review” and “most helpful negative review” first. 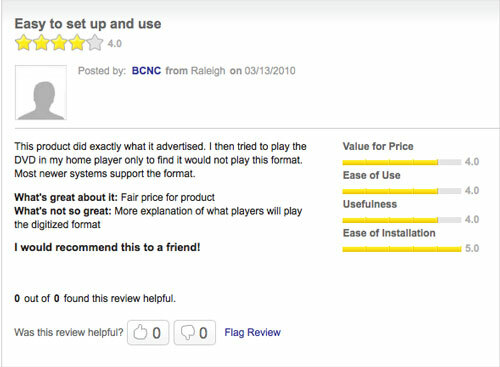 Sites that allow customers to provide star ratings for individual product attributes are also helpful. One can see a product’s strengths and weaknesses at a glance. E.g. if picture and sound quality are most important to you, you want to avoid TV sets that are reasonably priced (value) but lack in the areas you care about. Shoeline.com has one of the most creative feedback features I’ve ever come across. 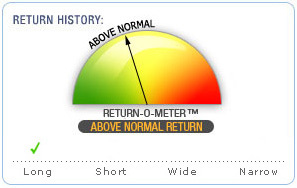 The Return-O-Meter shows visually the relative frequency a product is returned, along with most common reasons why, such as “fits short.” This helps customers pick the right size or width the first time. Product finders can also assist customers in finding appropriate products by asking the right questions. Jessop’s Camera has one of the most intelligently designed shopping tools I’ve seen. 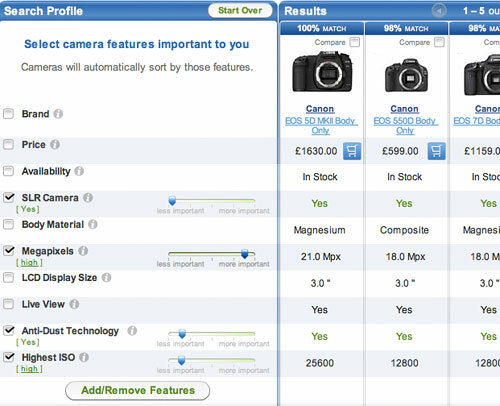 It provides dynamic product recommendations based on how important various camera features are to the customer. The attributes work together – when you adjust megapixels to the right indicating high importance, you’ll notice ISO slides left. Product suggestions also dynamically adjust, along with a relevancy rating. This instills a lot of confidence in making the right product selection, quickly. This visually teaches the customer that there are tradeoffs between features. With cameras, many folks are misguided by megapixels, thinking the higher the MP the better. If a product is purchased based on the wrong feature, which compromises other features, the customer is more likely to be dissatisfied and return the item, only to repeat the same mistake with another make and model. Another emerging technology is artificial intelligence. 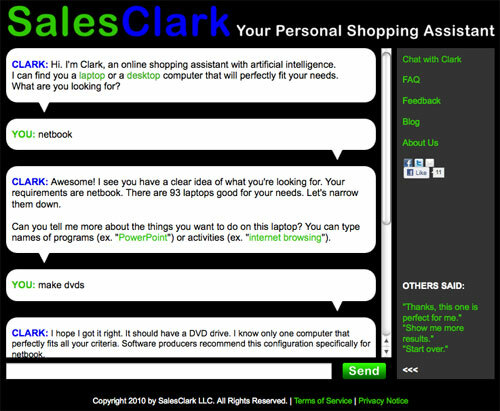 SalesClark is a shopping tool consumers can use to locate computer products. The virtual customer service rep asks a series of questions and finds products to fit a customer’s criteria. I’m expecting to see technology like this baked into actual ecommerce sites soon. SalesClark is programmed to catch conflicts between products and features customers think they want. For example, “MacBook for gaming” or “Netbook to watch DVDs.” Macs aren’t geared for gamers, and Netbooks don’t have space for a DVD drive. The virtual assistant will point out the problem and suggest more appropriate product types for the usage preference. Virtual customer service transcripts are another great source of information on what customers are looking for, as are email and live chat records. Mine them regularly for clues as to why some products are frequently returned, or what attributes are important to customers. Try to bucket reasons for return into common groups and review trends (NTF or “no trouble found,” “defective,” “wrong color,” “wrong size,” “incompatible,” “item not as described,” “wrong item,” “not what ordered,” etc.) 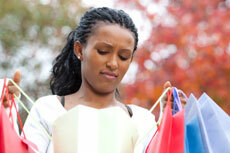 Don’t forget to include any data you gather from in-store returns. When touring Zappos headquarters, I was impressed at the CSR center. Customer service reps were free to walk around and pick up product to describe to customers. A customer could ask if the shoe “feels heavy,” or ask specifics like “how high is the heel?” Many times I’ve called customer service and the CSR has not had any contact with the product I want to buy, rather he or she can only help with product location or checkout issues. Training CSRs on solution selling is also key. They should have access to accurate information, such as device compatibility. I recently asked a CSR to help me find a USB headset that would work with Mac. He directed me to a product that indeed was not compatible, but the CSR told me it would be. The costs of a refund or exchange would be felt by both parties in such a case. Question and Answer tools on product pages can also reduce returns. Make sure you have staff experts answering questions. Too many sites let unanswered questions linger for months – which not only lets down the question asker, but shows all customers you don’t care much about service or don’t know much about your product. Knowledge bases are important for many product types, especially computers, software and other technical products. But KBs can also be tedious to use. Consider asking whether knowledge base entries are helpful, like Google. 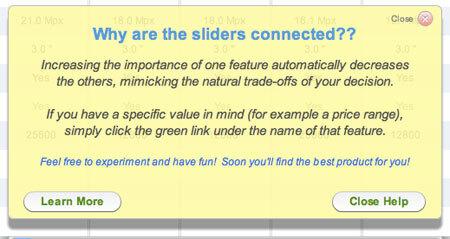 Also consider running some usability tests to see where users get frustrated navigating your KB. Product Return Optimization should be as important as Conversion Rate Optimization. You might not be able to do everything above, but even if you chose one area to focus on, you’re on your way to reduced costs and higher profits next year. Next articleWhat is Your WISMO Rate And How Do You Reduce It?